These delicious roasted carrots make the perfect side dish to just about any meal. Roasting at a high temperature brings out their natural sweetness and gives them the perfect caramelized edges and tender-crisp texture. Both a sweet and a savory recipe included. Carrots naturally develop a deep, concentrated flavor as they roast in the oven – this makes them taste spectacular all by themselves! I love this because that means they’re healthy and so easy to prepare. Carrots are also affordable and easy to keep on hand making them a great side dish, snack, or addition to just about any meal. I’ve been participating in a neighborhood health challenge for the past couple of weeks which has been a difficult but rewarding experience. The challenge includes scoring ourselves based on certain healthy activities we do during the day (exercising, eating fruits & veggies, limiting screen time, not eating sweets, etc.) While I’m not in the top running, (I blame the following: creme brulee, lemon bars, and snickerdoodles!) participating in the challenge has definitely increased my healthfulness. One of the perks of this health challenge is that I’ve been able to experiment with many new vegetable recipes. Without a doubt, roasted vegetables are my favorite way to enjoy veggies. (This roasted vegetables medley is always a go to in my home). I’ll be sharing my favorite ways to individually roast vegetables over the next few weeks. Starting today with roasted carrots! 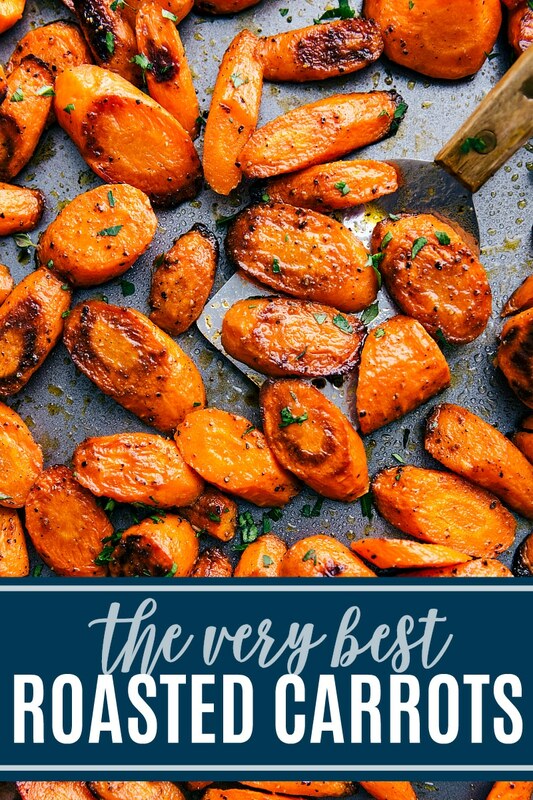 Below I’ll share the process for roasting carrots and then overview how to make both savory and sweet roasted carrots (additional detail in the recipe card). Prep the carrots: peel and slice about 2 pounds of carrots (reference the photo above for how I like to slice them). You want to make sure the carrots are about 1/2 inch thick in the thickest part of the carrot. Cut the carrots at a diagonal to increase surface area which will also increase those gorgeous caramelized edges! 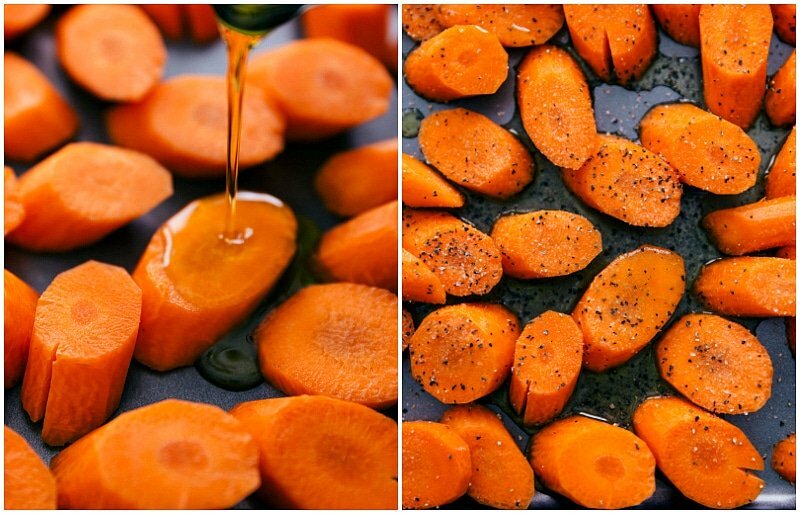 Season: add the carrots to a large sheet pan and toss with olive oil and seasonings. Roast: roast in the oven, flipping the carrots around at the halfway mark. Finishing touches: enjoy right out of the oven or add fresh herbs (for a savory version) or my cinnamon honey mixture (for a sweet version). There are 2 main ways to finish these roasted carrots: a savory version and a sweet version. Both versions are delicious and, depending on what I’m serving them with, I’ll alternate between the two. Toss 2 pounds of cut and peeled carrots in olive oil and seasonings. Roast for 20 minutes or until caramelized and tender. Toss the carrots with fresh herbs and serve immediately. 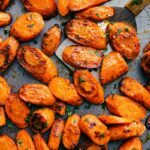 This roasted carrot recipe calls for 2 tablespoons finely chopped parsley or 2 teaspoons fresh thyme. Toss 2 pounds of cut and peeled carrots in olive oil and salt. While carrots are roasting, prepare the sauce by whisking together honey, melted butter, and cinnamon. 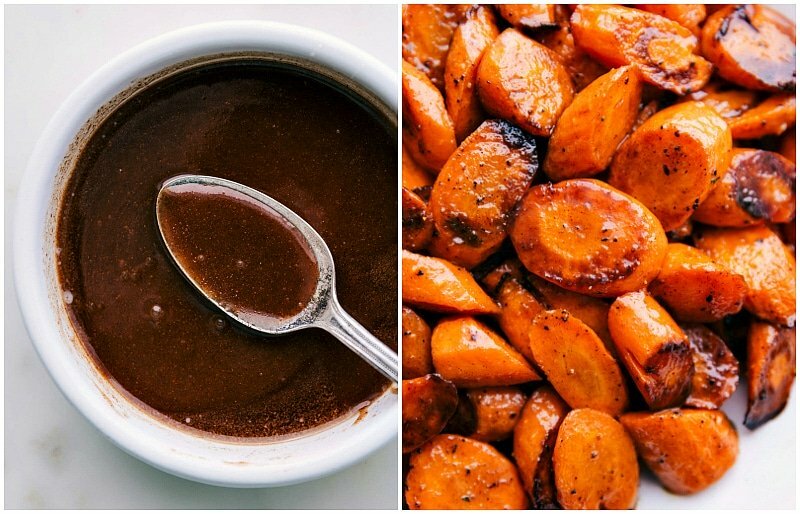 Remove carrots and drizzle the roasted carrots honey sauce over the carrots and toss. Serve immediately! Cut the carrots evenly: if carrots are cut unevenly (with some thick and others thin) they won’t roast evenly and you’ll end up with some that are burnt and others that aren’t cooked all the way. Roast for the right time at the right temperature: I have found roasting carrots in a 425 degree oven yields the BEST results. You get that perfect caramelization while keeping the perfect crisp tender texture. Weigh carrots: too much olive oil to carrot ratio will throw off the texture of the carrots. 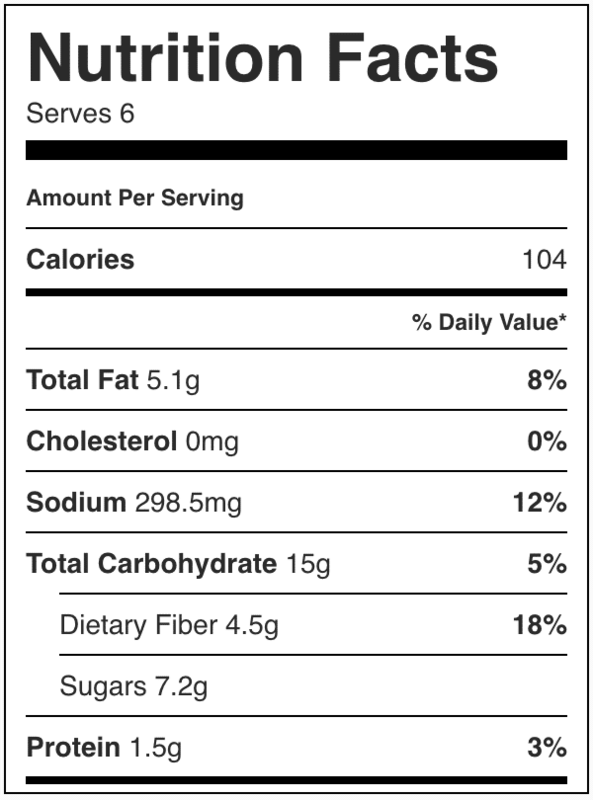 To ensure you’ve got the right ratio, make sure you’re using the right amount of carrots (2 pounds for this recipe). Use a LARGE sheet pan: this is my TOP tip for perfect roasted carrots! The more space the carrots have (aka the less crowded they are) the better they roast. When carrots are overlapping or jammed into a sheet pan, they end up steaming instead of roasting which greatly affects the end taste/texture. I’ve started using this 15 x 21 inch sheet pan – which is practically the width of my oven. With both a sweet and a savory option, these delicious roasted carrots make the perfect side dish to any meal! 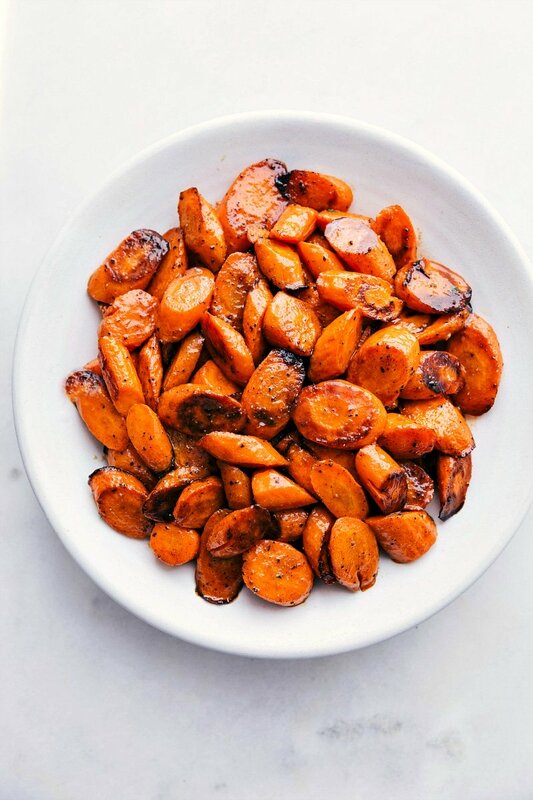 These carrots are roasted at a high temperature which brings out their natural sweetness and gives them the perfect caramelized edges and tender-crisp texture. Preheat the oven to 425 degrees F. Peel all the carrots and cut off the tops. Slice carrots on the diagonal so each piece is about 1/2 inch thick at the widest part (each diagonal cut you make should be about 1 inch apart). Make sure carrots are all cut around the same size to ensure even roasting. 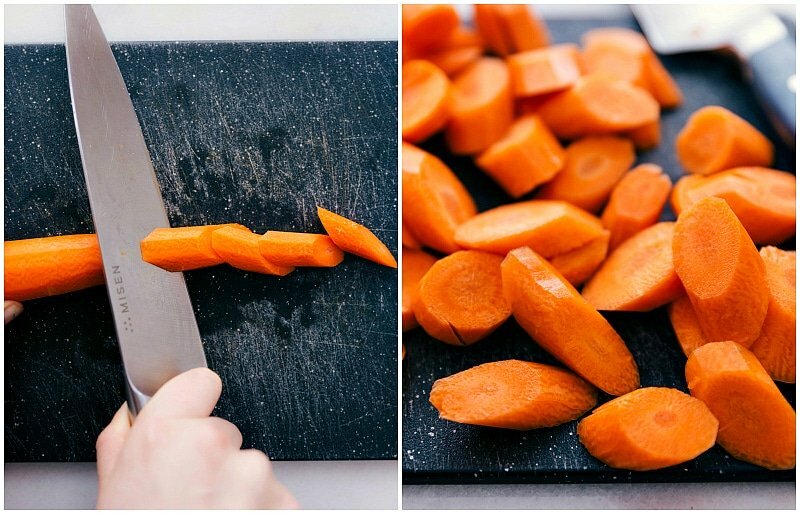 Add cut carrots to a LARGE sheet pan (I use a 15 inch by 21 inch sheet pan*). FOR SWEET CARROTS: Add olive oil and salt. FOR SAVORY CARROTS: Add olive oil, salt, pepper, paprika, and garlic powder. Toss to coat all the carrots. Spread carrots into 1 even layer and roast in the oven for 10 minutes. Remove from the oven and quickly toss/flip the carrots then return to the oven. Bake for another 8 to 15 minutes, until caramelized and tender. (Time will vary based on actual oven temperature, how spread out carrots are, and personal preference for how roasted you want the carrots). Remove the carrots from the oven. FOR SAVORY CARROTS: toss with fresh herbs and serve immediately. FOR SWEET CARROTS: whisk together honey, melted butter, and cinnamon in a small bowl until smooth. Drizzle over carrots and toss. Serve immediately. Leftover carrots will keep well in the fridge (covered/stored in tupperware) for 3 to 4 days. *One of the "secrets" for the very best roasted carrots is to make sure they have PLENTY of room on the tray and aren't overlapping/touching. The larger the tray you can use, the better your carrots will be! What temperature do you roast carrots at? It typically takes about 20 minutes to roast carrots at 425 degrees. How long do you roast carrots at 400 degrees? How long does it take to roast carrots at 375? 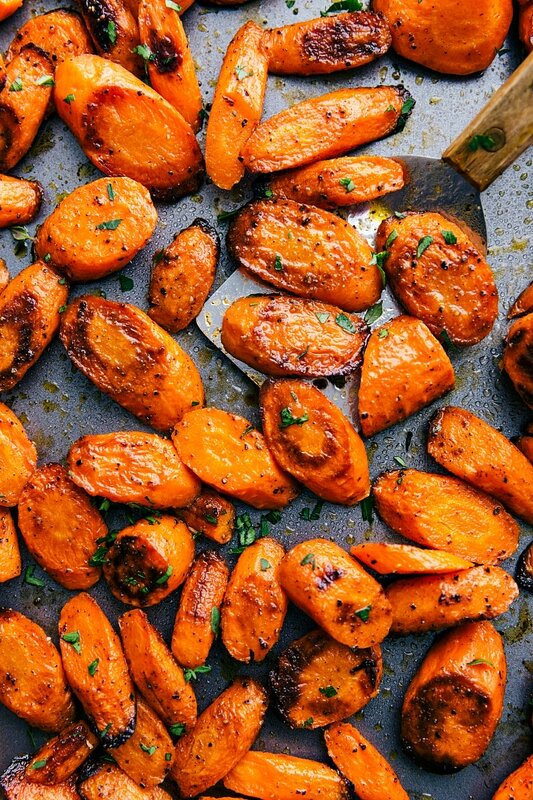 Carrots generally need 25-30 minutes to roast at 375 degrees. I recommend checking them at 25 minutes adding time as needed. How long does it take to cook carrots in the oven at 350? At 350 degrees, your carrots will need about 30-35 minutes to roast. Again, make sure to check for doneness early and add time as needed. What other veggies could I roast alongside these carrots at the same temperature and time? Other root vegetables, such as potatoes, parsnips, and beets, should roast well with carrots at the same time and temperature. Roasted potatoes and carrots are a classic and delicious combo! Just make sure all vegetables are cut into roughly equal sizes. Carrots also typically roast well with onions, brussels sprouts, and broccoli. You can read more about how to combine and roast different veggies here. How do you steam carrots? This post covers the ins and outs of roasting carrots, but steaming carrots is another great way to enjoy them. Here is a great resource for how to steam carrots. Do you roast carrots with the skin on? Ultimately you don’t ever really have to peel carrots. If they’ve been washed and scrubbed (to remove dirt/debris) unpeeled carrots are safe and delicious to eat. However, I do not recommend roasting carrots with skin on. The texture becomes less than ideal and the taste is more bitter/earthier. Cooks Illustrated goes more into depth about this here. You can cook carrots ahead of time and they work great for weekly meal prep (like in this Moroccan Carrot Salad), but if you’re enjoying roasted carrots as a side dish to a meal, they are best right out of the oven! These carrots are to die for! They roasted perfectly and the seasoning was amazing! I couldn’t stop my kids from snacking on them before dinner I literally had to roast another tray! This is my go to side dish! Thanks so much!